ATTENTION: ES Futures Day Traders. Are you frustrated with Emini Trading Rooms you have joined in the past or are currently a member of because of Confusing and Ambiguous Trade Calls? Now You Can Eliminate The Problems Found In Most Trading Rooms. I have created one of the most valuable software tools for daytrading the E-Mini Futures – available anywhere. It’s a stand-alone, platform independent program that sends Real-Time ES trade alert levels right to your computer’s Desktop. Better yet, the signals are generated by a new state-of-the-art Automated System, not a human trade caller. The calculated Trade Barriers are Fully Automated – Completely Mechanical – Backtested and Rule-Based . If you have a Futures account and can properly execute 3-5 trades a day – This Software Is For You! This brand-new strategy works by adaptively monitoring market price boundaries where we will have a high likelihood of breaking out and exploding into large-scale Trending moves – long or short. It utilizes a formula which I call the “Dynamic Trigger Range”, a super exciting new price analysis concept that I came up with during my research in 2017 and which quite frankly gives the best E-Mini Trading Signals I have experienced during nearly a decade as an online futures trader. Brand-New Technology For The Active Trader! The Signal Alert Software is a stand-alone program and platform independent – so it doesn’t matter if you are trading with Think or Swim (TOS), Trade Station, NinjaTrader or any other Futures platform – you will receive the Signal Alerts and can execute trades manually with your existing broker. Our Momentum Signal Alerts are finely calibrated to capture breakout style price moves that have a high probability of running 4 points and greater. Using our specific trade configurations the system gets you to a break-even, no lose position a high percentage of the time thus reducing risk. Once a trade moves just 1 point in your favor it’s possible with the proper money management configuration (chart below) to reach a protected no lose state while at the same time utilizing tight initial stops to keep overall risk low. Trade Along With My Automated E-mini Trade Alert System – as it transmits actionable trading alert barriers directly to your desktop. Start getting only the best emini trading signals each trading day. You will know EXACTLY where the high-probability levels are to play Long or play Short, and when and where to trail your stop, as well as where all the high probability targets are located, all this without ever having to log into another trading room and listen to trade-callers mumble-out entry points based upon their personal opinions again. Your Power Emini Desktop Alert Software includes 2 separate ES trading algorithms. The ES-M tab in the software runs the Momentum Breakout System, which is intended to capture LARGE POINT MOVES (10, 20, 30, 50 points) on days where the market makes a big directional, trending impulse move. There are typically 1-3 Alerts per day with this system. The Power Scalper algo on the ES-S tab is for active intraday trading – based on tighter tolerances and a different calibration of the Dynamic Trigger Range. The Power Scalper runs the same Momentum Breakout System algorithm, but the different calibrations means the Dynamic Trigger Range is more adaptive to price movement and you will generally see about 20 alerts throughout the trading session. The Power Momentum Breakout System. Why This Is The Best Approach To Trading the ES Futures – Available Anywhere. Special Offer: This is your chance to tap into – and experience the power of Automated System Trading starting Today. If you are an active E-mini Futures Day Trader, take the Trading Signals in the Alert Software for a test-drive and trade in sim mode. Convince yourself that this is the big “Game Changer” you’ve been looking for. Q: How many trades per day can I expect and what are the hours I will receive signals? A: The Momentum System in the Alert Software typically generates 1-3 high quality trades per day. The Power Scalper (included) is a much more active system and you will see roughly 20-30 Alerts a day – both long and short. The Momentum Breakout Alerts – with audio – start 20 minutes after the cash open at 9:30 Eastern time. The Power Scalper system runs around the clock 24/5 – however the best trading hours are typically during the U.S. cash session and the European session, when there’s plenty of volume, participation, and price movement. Q: What instruments does the software give alerts for? A: The ES, NQ and YM Futures are included at this time. We also recently added CL (oil). Q: Do I have to trade with a specific broker or on a certain platform? A: No. The Alert Software is a stand-alone Windows program that delivers signals right to your Desktop and you execute the trades with your current broker on whatever platform you are using. However, if you are a NinjaTrader user we have a “Companion Indicator” that plots everything in real-time right on your charts – included at no extra charge. Q: Is your Automated Alert System Really better than Discretionary Trading? A: Following fully Automated System Signals in trading can offer several distinct advantages to human determined entry points. The problem, is that humans as smart as they are, get lazy, or tired, or sloppy, or emotional or opinionated which can all have negative effects on being able to effectively call the twists and turns of a dynamic market like the Emini Futures. An automated trading strategy suffers from none of these problems and feels no fear or confusion nor does it hesitate. It is designed to issue Trade Alerts on statistically verified market conditions that develop just before large momentum breakouts occur. It doesn’t think about what it is doing.. just quantifies and scores the environment, reacts and signals when the criteria is met. Our job as system traders is to follow the strategy signals and focus our energy on managing the trades and not worry about where or when or why.. but instead focus on our exit strategy of targets and trailing stops. Q: If your system is so good, why should I Sim Trade it before going live? A: When starting anything new it is always wise to first go through a warm-up, learning curve period to familiarize yourself with how things work in practice. This is especially important for adopting a new trading approach because we will be risking our hard earned capital. There are two main challenges, 1.) getting the order-entry mechanics down pat so you don’t make entry or trade management mistakes which could cause you to botch your trades up and lose money. 2.) Building your confidence and demonstrating to yourself that my new Momentum System Trading Approach really works. If you start off live right away, you may hit a temporary rough patch, making you gun-shy and forcing you to quit before you truly have the chance to see how nicely the point gains pencil out at the end of the week. Q: Do you offer a free trial of the Alert Software? A: We shy away from the Free Trial Mindset. If you are serious about trading the Emini, you need to have some skin in the game. (Putting things in perspective, the cost of our 1-month trial is equal to a 1 point stop-out on a 2 contract trade.) Also, we can’t just divulge every secret to anyone that comes along and wants a free trial to our strategy. In order to understand the approach you will need to watch detailed training videos that reveal our proprietary E-mini trading system. Yes, the signals from the software are simple to follow, but without having gone through the tutorials and learning the mechanical rules of the strategy you may have trouble following the system and get yourself into trouble. The best thing to do is sign up for a 1-month trial and commit yourself to the short learning curve. The algorithm and strategy for e-mini trading we use are unlike anything you have seen before and easily worth the effort. If you decide to stick around you will continue to receive super sophisticated entry signals for $5 per trading day or the same cost of just 1 commission on a 1 contract trade. How is that for reasonable? Q: Does your alert Software work on Apple computers? A: Yes our software installs and works great on Apple computers but you will need to use a basic Windows Emulator program like Windows Parallel for Mac or Oracle VirtualBox. Trading Signals have never been so Clear, Concise and Accurate. Nothing to analyze. No Indicators to install on your charts. Just follow the System Trade Alerts. Even experienced practitioners will be impressed at how straightforward and effective this strategy is. Start receiving Precision Trade Signals at lightning speed. Sign up for your first month and take the New Power E-Mini Momentum System for a Test Drive and convince yourself. Trade every single alert on Sim – stick to The Rules – and at the end of each week tabulate the final results. If you aren’t completely convinced you can drastically increase your point gains just cancel. Give it a fair evaluation and we’re pretty sure you’ll stick around as a member of our group. After all, the monthly cost of our alerts is equivalent to a 1 point ES move on 2 contracts. Tap Into The Power Of Backtested Algorithmic Day Trading Alert Levels – Specifically Designed for Emini Futures. – You will receive everything you need to get started right away via email, including comprehensive documentation and supporting videos. – Trade on Sim for a few weeks – track your results – and prove to yourself that our Automated Alerts and Trading Strategy are what you’ve been looking for all along. Simply Follow The Trade Alerts Mechanically. With this approach, there is much less to analyze on the charts. Following the system mechanically is an ideal way for beginning Futures Traders to get started, as it allows them to immediately begin following a winning formula using strict non-emotional, rule based trading tactics. A New Trader’s learning curve is reduced all the way down to just having to be able to learn how to place orders correctly and follow a simple trade entry trigger mechanism we teach you so that you know exactly when to enter each trade. (No complex technical analysis skill or emotional judgement calls required on your part). The Busy Professional. Another person that the Power E-mini Alert software will benefit is the busy morning trader, who may be involved in his/her home business during trading hours. If you are one of these folks, who would like to trade each day, but you just don’t have the luxury of being able to watch charts – hunting for trade setups all morning – the Power E-Mini Alert software is your answer. Audio alerts call your attention to every potential trade setup in plenty of time for you to take action after a quick review of the charts if you like. This allows you to be able to participate in trading with the least amount of time invested from your busy schedule. Discretionary Trading Approach. If you are already an experienced E-mini Trader, perhaps with your own detailed plan, you may be looking to include additional high-quality trade setups into your morning routine. The Power E-mini Desktop Alert Software is going to be sending out high probability momentum breakout levels each day – which are ideal for the savvy, self-styled, discretionary trader who wants to add more fire-power to their daily arsenal of alerts. Easily incorporated into almost all trading styles, our momentum breakout alerts can be scalped for quick profits or ridden for large multi-point runners, all determined by your discretionary style of trading or the trailing stop methodology that you use. 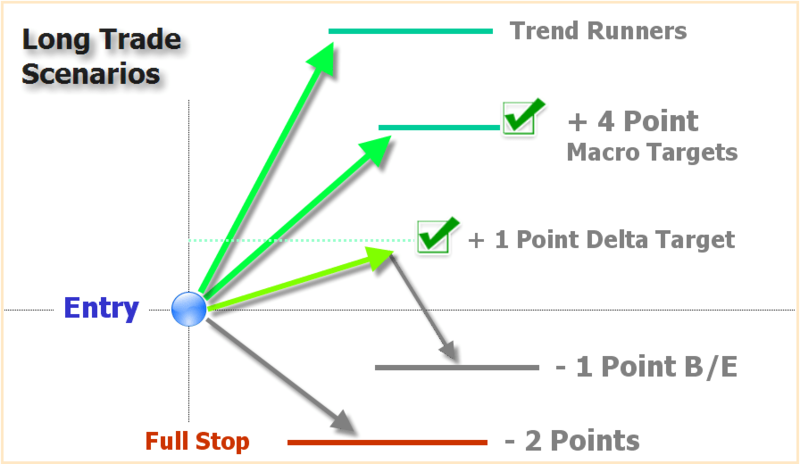 (We teach you an excellent trailing stop methodology designed by Power E-mini if you currently do not have one). Bottom line is – here is an additional source of high-octane E-mini trading setups – sure to enhance your weekly ES point gains. More and more highly successful traders are finding that a systematic/discretionary mix is the way to go. Following the Power E-Mini Dynamic Trigger Range allows you to experience the perfect blend of both systematic and discretionary techniques and is the next best thing to having your account traded by a high-performance robot – but with our alert software your money stays in your account and you always stay in control. Emini Trading Levels so precise you will wonder how we do it!